Kyle: So you’ve started to touch on this, but how did you get into tabletop streaming? Will: Kind of a trifecta here. My wife and I started backing things on Kickstarter. First home type stuff, then we started looking at some of the amazing games that were popping up in our feed. At this point we were light-medium board game players (Catan, Dominion, Ticket to Ride, etc.). I always wanted to get into more involved games and Kickstarter was featuring some of the latest and greatest at this point. The second printing of Gloomhaven, Brass, Roll Player, One Deck Dungeon; to name a few. One day while checking the activity feed on One Deck Dungeon, we saw that a stream named Crit Camp would be hosting them and that they would be giving away a copy of the during that stream. I popped in and I was amazed that they had about 20 constant viewers, and they were just playing a board game! Like I did with friends every week. While they were playing and chatting with the designer of the game, I started asking questions of both the streamers and designers. I had a great time with the stream that night and I dropped extra donations to the stream to increase my chances to win a copy of the game. After that experience, I spoke with my wife and presented her with my plan. I would work on a game based on my years in retail, and I would put together a stream where we play boardgames with friends and viewers of our twitch channel. In three days I had the main mechanics of my board game done. In about two weeks I had my first prototype and in about a month I started experimenting with how our stream format would develop. The amount of time I was spending on stream overlays and promotion ideas started to sweep me away from the game I was designing, and now we are here. So Kickstarter, a latent passion for gaming, and former Twitch experience. The trifecta. Kyle: So you had previously done stuff on Twitch? Will: Yeah, I used to be pretty involved in MechWarrior Online and I would stream some of our practice sessions and competitive matches. Kyle: I am still trying to wrap my head around how fast you rolled out and built the channel. There seems to be quite the demand for streaming boardgames? Yes, you have a good chance of grabbing a small to medium sized following on Twitch. 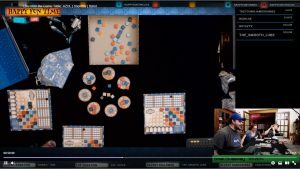 I am still new to the board game streaming game, but many of the same rules apply for board game streams as they do to (video) game streaming. We do Wednesday and Friday nights starting at 9:30pm EST. It’s late, but we keep pretty even viewership in this slot due to the transition of timezones. EST people pop in for the beginning of the stream, and some stay, while CST, MST, and PST people start to fill in later in the stream. Friday is our more popular night because we have more people on stream while we are in my dining room, and I have some characters who are friends. Many of my friends “get” the stream presence aspect and they know when to play off of each others’ personalities to keep the stream entertaining. I want to bring the tabletop gaming experience to people who either don’t understand it, or who yearn for it, and don’t have the ability to sit down with friends like we do. In terms of success, just like anything else, the three main factors are inspiration, effort, and luck. If you hit all three you will be a true success on Twitch. Which brings me to one of the most important aspects of Twitch streaming. There are 3 levels of users and conversions you are dealing with… Viewers, Followers, and Subscribers. Each level is vastly important in making a mark for yourself as a content creator. Big data is a part of all of our lives now, and many companies won’t even give you a glance if you don’t hit metrics that they run against your account. Let’s start at the top. Subscribers: These are your biggest supporters. Fans, Friends, and Family. They contribute monetarily to your channel, and they help build up your kitty so you can improve your stream quality and possibly spread some of the money they give back out across your community (Giveaways, Contests, propping up less fortunate followers). Followers: these people enjoy your content and by following your channel they will likely get notified the next time you go live. These are often fans who cannot drop extra support, but they are loyal and they will keep your average viewer count up (this is a BIG metric in measuring stream success). Lastly, the viewers: these are first time visitors or lurkers who are just checking in to see what it is you do. You hope they catch you during the most entertaining aspects of your stream, but not all viewers will click that follow button. There have been times that I had people donate or subscribe and not follow until two or three months later. True Twitch success as a content creator is hitting triple digit average viewer numbers every day you go live. We are still far from that goal. Kyle: This is all very enlightening. So what does your audience ‘look’ like? Who watches boardgame streaming? Will: That is a very interesting question. I’ve found that our most active viewers are people who would like to play board games more, but they either lack the resources to keep up with the hobby or they don’t have a circle of friends who are interested in it. I believe that people are all very similar at their core, and if you could break through the surface differences you could make a really meaningful connection. Often times when meeting new board gaming people, I have to stop myself from making snap judgements about them and just connect on what has brought us together, the games. After a few games I start to have more personal conversations with them and get to know them as more than a person who will play games with me. We do the same thing on our stream. We even invite followers to join us on our Wednesday streams when we play live on Tabletop Simulator. Kyle: What types of things does your audience, or any audience for streaming tabletop games, want to see? Are they watching to learn games? To make purchasing decisions? To be entertained? Will: I think there is a mix, but on Twitch they primarily watch to be entertained. They like to get an idea of the game, but we usually get more people watching and interacting when our players poke fun at each other or roll poorly on a turn. It depends on how I promote a stream as well. If I just say we are going to play a game, my audience loves to see me get frustrated learning and playing that game. If I promote one of our “conversations with creators” they expect to relax and learn about the game designers motivations for making the game. And then in part two watch me get frustrated while learning the game. Kyle: You mentioned you stream Tabletop Simulator. It sounds like you stream in person as well? Will: Yes. Every Friday night I stream from my dining room. I’m hoping to have my garage remodeled in a few months. It will end up being my streaming studio and creation area. I also try to work with conventions so I could stream designers and paragons of the communities while I’m there. Those are still newer and I’m working out many bumps in that process. Unpub was a great testing ground for that and a big learning experience for areas I could work on improving the entire process. Kyle: What are the differences and challenges between Tabletop Simulator and in person streaming? Will: There is a learning and comfort curve to using Tabletop Simulator. The modules are built by the community and aren’t always created with the creator’s permissions. It’s kind of the Napster of boardgaming. Tabletopia is a bit more supported by the industry, but there is a $10/month fee to use Tabletopia and the selection is nowhere near the collection you have access to with Tabletop Simulator. Will: Tabletop Simulator is also much less personable since you aren’t seeing all of the players involved. You could hear voices, but there are certain games where the experience is hindered by not being able to “read” the other players. In person is preferred but there is much more involved in setup and maintaining the stream. Sound is one of the biggest challenges in live in person board game streaming. Especially when on a tight budget. My ideal live, in person setup would be having a camera looking down at the main play area, a camera for each player’s area on the table and a two cameras to see the people sitting at the table. And wireless mics for each person at the table feed into a mixing board. But cost and finding a dedicated producer and cameraman to handle the setup while I’m hosting would likely never financially balance out in the positive for me. At this point I would estimate between board games, equipment, prize support for giveaways, and promotional tools. I’ve invested close to $10,000 into what I do. Closer to $30,000 if you consider the time I’ve invested and existing equipment I’m using. And I’ve made a grand total of about $300 from donations and Twitch payments. More is on the way from Twitch but payments from them at the affiliate level are delayed by 60 days. I’m expecting about $1,000 over the next two months. Most of it is from the generosity of close friends. Kyle: Some readers have expressed an interest in your technical setup. You’ve touched on that a bit here, but what have you got going on? I have formatted Will’s response as a list for simplicity. He would be more than happy to provide details to anyone interested. Samsung Laptop with i7 processor, 700 Series Nvidia graphics and 8 GB of RAM. Same advice for VST plugins but different setup for the environment. For streaming at live events I just use my Pixel 2 XL phone with an app called Bit stream, it works for now, but I am looking at better solutions in the future. Once I get the studio setup, I have a second desktop that will handle all of the streaming and I will dedicate my current desktop to the video game streaming and I will be able to retire the laptop as it has been having issues of late. Kyle: As we wrap up, did you have anything else you’d like to mention? Will: I just want to plug other streamers who have influenced me.Crit Camp, Playing Board Games, and Warwitchtv. There are many others who I watch, but those three helped me develop my channel and individual presence. I’d also like to thank all of the guests we have had over the past few months and let anyone who is interested in being a guest, the invitation is open. I just need them to email or DM me on Twitter. happyfuntimelive@gmail.com and @happyfuntimebgs on Twitter. Kyle: Alright, time for our last question. What is your favorite game? Will: My favorite game is Dominion. 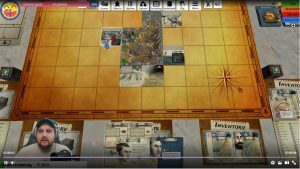 Our favorite to stream so far has been Mansions of Madness. The 7th Continent is my most recent love though, and Sagrada holds a special place in my heart. Kyle: Thanks for coming on! I look forward to seeing where your stream goes from here. Will: Thank you so much for the opportunity to chat about my passion. I wish you the best as well.